Our research is focused on the analysis of the eyespot apparatus, the „eye“, of flagellate green algae. Using a combination of biochemical, cell and molecular biological techniques we try to functional characterize this primordial visual system. Due to their elaborate structures and the presence of retinal-based photoreceptors in some lineages, algal eyespots are thought to play an important role in the evolution of photoreception. The eyespot apparatus of green algae utilizes specialized microbial-type rhodopsins as photoreceptors, which act as directly light-gated ion channels. After establishment of an isolation method for the eyespot apparatus in its entire complexity and its core and phosphoproteome (Schmidt et al. 2006, Plant Cell 18: 1908-1930; Wagner et al. 2008, Plant Physiol. 146: 772-788), we are now interested in the signal transduction cascades leading to the photoresponses of these algae and the mechanisms underlying the tight interaction of the different subcellular compartments in this region of the cell. Our current focus lies on the functional characterisation of novel Ca2+‑binding proteins and the analyses of protein-protein interactions and protein complexes. Another topic is focused on the funtional analysis of the photoreceptors channelrhodopsin 1 and phototropin. For this we are employing different experimental approaches like e.g. RNAi, phosphorylation analysis, immunoprecipitation and different 2D-electrophoretic approaches in combination with mass spectrometry. Our main model organism is the green alga Chlamydomonas reinhardtii. Some advantages of this alga, except those already pointed out by Mike Adams („Chlamydomonas is pretty, non-pathogenic, doesn´t stink, doesn´t contaminate other cultures and no one cares if you kill it.”), are summarized here. Although eukaryotic, standard microbiological techniques can be applied. The cells can be grown either autothrophic, heterotrophic or mixothrophic in well defined liquid media or on agar. Culturing is easy and large amounts of cells can be grown under axenic conditions, e.g. we can grow up to 100 L of cultures per week. C. reinhardtii includes asexual and sexual reproductions in its life cycle. The sexual reproduction can easily be induced by nitrogen starvation and blue light. C. reinhardtii is genetically well characterized. All three genomes (nulceus, chloroplast, mitochondrium) are sequenced and can be transformed by simple techniques. Diverse, large mutant collections are available. Mutants, BAC and cDNA libraries can be obtained via the Chlamydomonas Center. The cells are motile and their different behavioural responses can be analyzed easily. Many of ist proteins have higher homology to mamalian proteins than to those of higher plants. Hence Chlamydomonas is also a model for some human diseases, especially those related to flagella dysfunction. The ultrastructure of its eyespot apparatus is depicted briefly in Fig. 1A. It is a singular structure of ~ 1 µm2 and can easily be detected in the light microscope due to the massive accumulation of carotenoids. Detailed ultrastructural and biophysical analyses have shown that the functional eyespot apparatus involves local specialisations of different subcellular compartments (plasma membrane, cytosol, and chloroplast). Fig. 1: The eyespot apparatus of Chlamydomonas reinhardtii in the light microscope (A1, white arrow-head), in the transmission electron microscope (A2) and as a schematic drawing (A3). Structural intact eyespot apparatuses can be isolated by sucrose density gradient centrifugation (B). The ultrastructure of the functional eyespot apparatus is complex and involves local specializations of membranes from different compartments. 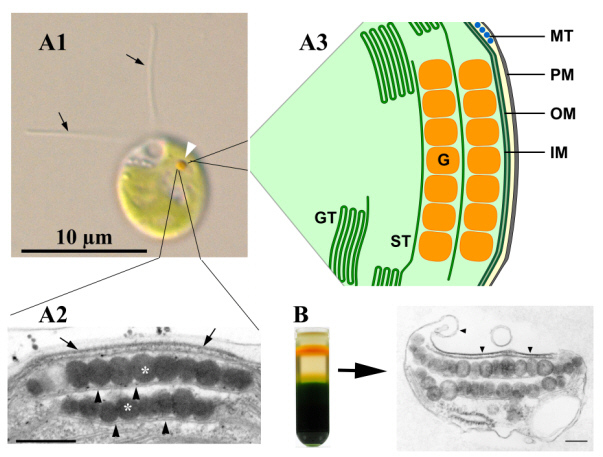 In Chlamydomonas reinhardtii, the eyespot apparatus is usually composed of two highly ordered layers of carotenoid-rich lipid globules inside the chloroplast (Figure 1A ). The globules exhibit a remarkably constant diameter of 80 to 130 nm and are subtended by a thylakoid membrane. Additionally, the outermost globule layer is attached to specialized areas of the two chloroplast envelope membranes and the adjacent plasma membrane. This whole complex can be isolated as a structural unit (Fig. 1B). The plasma membrane and the outer chloroplast envelope membrane above the eyespot globules are extremely rich in intramembrane particles. The photoreceptors identified so far are generally believed to be located in this plasma membrane patch. Light-dependent oriented movement responses (phototaxis) require the cell to determine the direction of incident light. Chlamydomonas most likely accomplishes this by monitoring the modulation of the light intensity reaching its photoreceptors in the eyespot apparatus as the cell rolls around its longitudinal cell axis during helical forward swimming. Increasing evidence points to additional important roles of the eyespot apparatus beside those in light perception. A more detailed description of the structure and function of this algal “eye” can be found in the following review (Kreimer 2009, Curr. Genet. 55, 19-43).